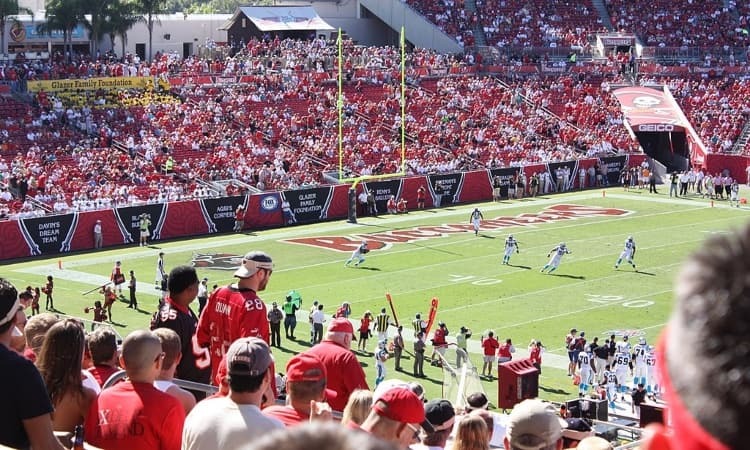 Local sports teams and groups of fans can rely on GOGO Charters for charter bus rentals to Tampa sporting events. Travel in a charter bus with your entire team in tow to your next big game. You’ll arrive in a timely fashion and in ultimate comfort, ready to secure a win! Contact our offices 24/7 at (813) 452-6111 if you have any rental questions! Is your team playing a big game and in need of gameday transportation? GOGO Charters has your entire team covered! We’ve serviced sports clubs, amateur teams, and even groups traveling for special events like marathons or tournaments. A GOGO Charters bus rental will allow your team to travel together rather than splitting up in a cramped carpool. You’ll also have a professional driver handling the roads so everyone can focus on preparing for the game ahead. We offer spacious charter bus rentals so Tampa teams won’t have to worry about leaving behind important equipment on the way to the game. The full-sized buses we charter have large luggage bays underneath the bus for your team’s gear. Need easy access to personal items while traveling to your game? You’ll have overhead storage compartments to store anything else your team needs. Never stress again about how your team will make it to an away game. GOGO Charters services most major cities beyond just the Tampa Bay area. Whether you’re playing a game in Orlando, Jacksonville, or Miami, we’ll keep your team on track to arrive at the away venue with time to spare. Traveling long distances can also be taxing on an athlete's body, so it's important that everyone is comfortable on the road. Players can relax in plush, reclining seats and climate-controlled cabins while enjoying complimentary WiFi and entertainment systems. Are you and a group of friends or family planning to attend a special sporting event in Tampa? Shuttle your entire marathon group to the Gasparilla Distance Classic in a compact minibus! You’ll have a cool and comfortable charter bus to relax in after a long day of running. Or travel with a group of loved ones to enjoy a day of horse races at the Tampa Bay Downs. You can enjoy the races, poker, and good drinks and food to the fullest, you’ll have a professional driver behind the wheel when you’re ready to head home. Fans of Tampa Bay’s professional teams should consider chartering an efficient minibus to get to upcoming games. Travel with a group to Raymond James Stadium to cheer on the Tampa Bay Buccaneers or over to Amalie Arena to support the Tampa Bay Lightning. With a GOGO Charters rental, you’ll have enough space for all your tailgating gear before the game. Are you a big fan of the New York Yankees? Catch a spring training game at George M. Steinbrenner Field with a private charter bus! Attending a USF Bulls game should be filled with fun, not the stress of finding transportation or a designated driver. USF Bulls football is held at Raymond James Stadium, around 10 miles from the school’s main campus. Large groups of students looking to support their team shouldn’t have to rely on rideshare services or limited campus shuttles. Finding a rideshare large enough for your group may be difficult, and Bulls Blitz campus shuttles are reserved exclusively for current USF students. Renting a private charter bus with GOGO Charters means you can personalize your trip and travel with whoever you please: alumni, non-student friends, and even family members. Booking a Tampa charter bus for your next sports trip is quick and easy! We’ll take into account all of your trip details, provide you with an accurate quote, and pair you with the best bus and driver for your needs. All you need to do is contact us anytime at (813) 452-6111! Tallahassee, Jacksonville, Daytona Beach, Cape Coral, West Palm Beach.